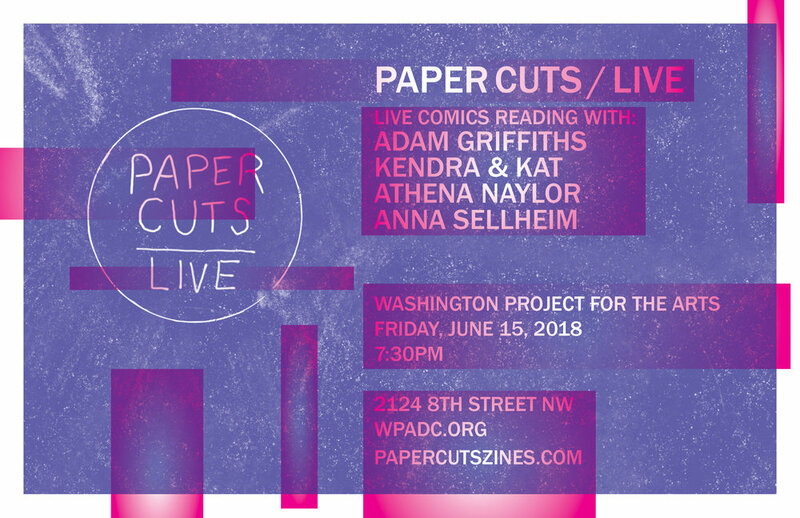 For PAPER CUTS / LIVE, artist Christopher Kardambikis is showcasing the work of artists and collectives from the dense and vibrant independent publishing communities between Philadelphia and Richmond. He has curated a selection of zines for our bookshelves, and will conduct monthly live, in-gallery interviews with some of the publishers for podcast distribution. The installation and series of events will act as a cross section of this varied landscape and rich history. Kardambikis founded Paper Cuts as a radio podcast on Clocktower Radio in 2015. 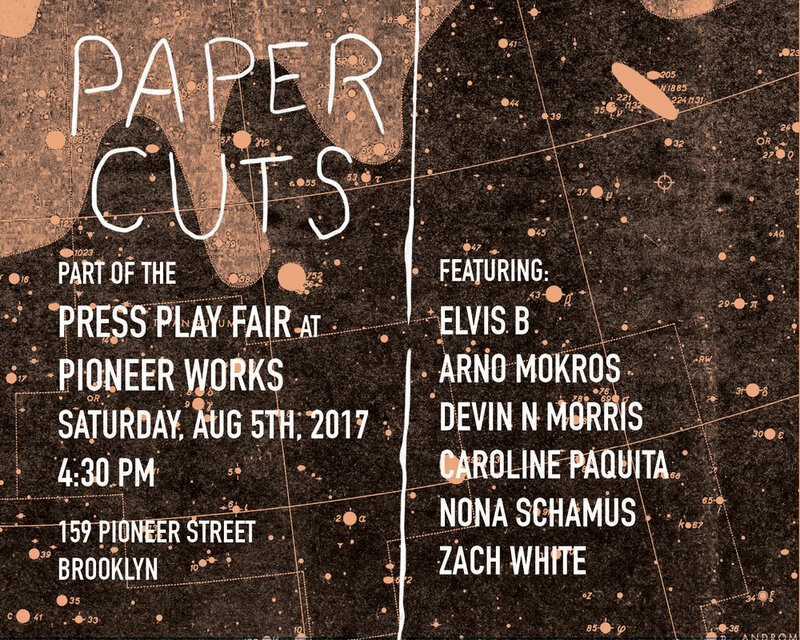 Each program features writers, performers, and artists who have shared their work in print, on paper, and in small editions. Kardambikis is an Assistant Professor at George Mason University and the Director of Navigation Press. Adam Griffiths is a cartoonist, illustrator and arts organizer based in the DC region. Griffiths' studio practice is cartooning, comics, and illustration-focused with a politicized, diy image production ethos that he calls ZAGO. He has exhibited his illustration and video work with Washington Project for the Arts, Hillyer Art Space, School 33, the International Curatorial and Studio Practice (ISCP) program, and Transformer Gallery. He has completed workshops and residencies at The Center for Cartooning Studies in White River Junction, VT and Comics Workbook in Pittsburgh, PA, and tabled at the annual Small Press Expo (SPX) in Bethesda. He will present his first solo show at Arlington Art Center in Virginia in 2018. Recently, he published the first installment of his 600-page graphic novel Washington White as a tabloid newspaper, and last year released his first mini-comic, The Permanent Night. Online, he posts full-color illustrations, numerous character sketches, works-in-process, and a weekly comic strip titled American Cryo-. Kendra & Kat have been making comics together for 8 years, and plotting over cupcakes for far longer. With comics and zines that run the gamut from queer space pirate shenanigans to illustrated cookbooks inspired by Dwayne "The Rock" Johnson, they are driven by sparkles and fun. 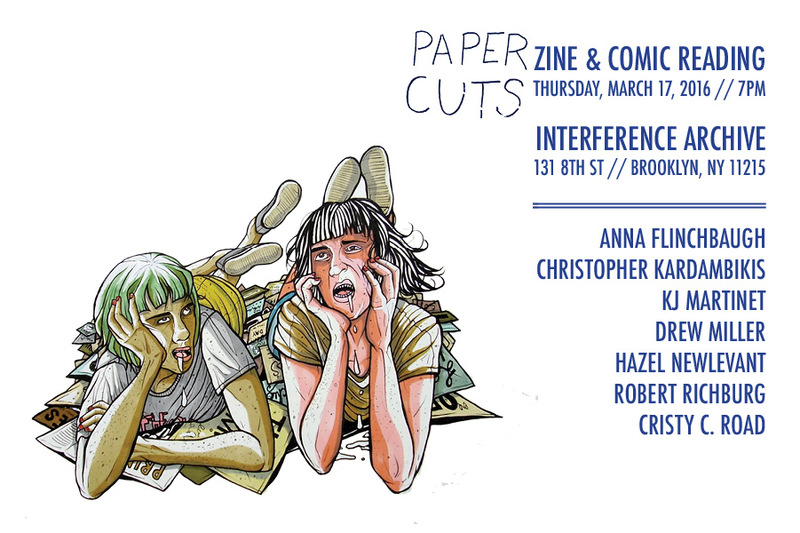 Their work has been featured in anthologies such as Coven and Purity, and they've been a staple in the DC-area comic scene since tabling at DC Zinefest back in 2012. Athena Naylor is an autobiographical cartoonist and illustrator based in DC and originally from Milwaukee, Wisconsin. Included in her many interests are: perceptions of memory, everyday absurdity, and contemporary adaptations of historical events and stories. She earned a master’s degree in art history to explore the relationship between art history and comics, and her writing has been featured in DIRT magazine. You can most easily find updates on her current creative projects on instagram @athena.naylor. Anna Sellheim is a cartoonist practicing out of Rehoboth Beach DE and is desperately trying to relocate back to the DC/Baltimore area. Her work tends to focus on mental health and progressive politics. She received her MFA in cartooning from the Center For Cartoon Studies in 2016. 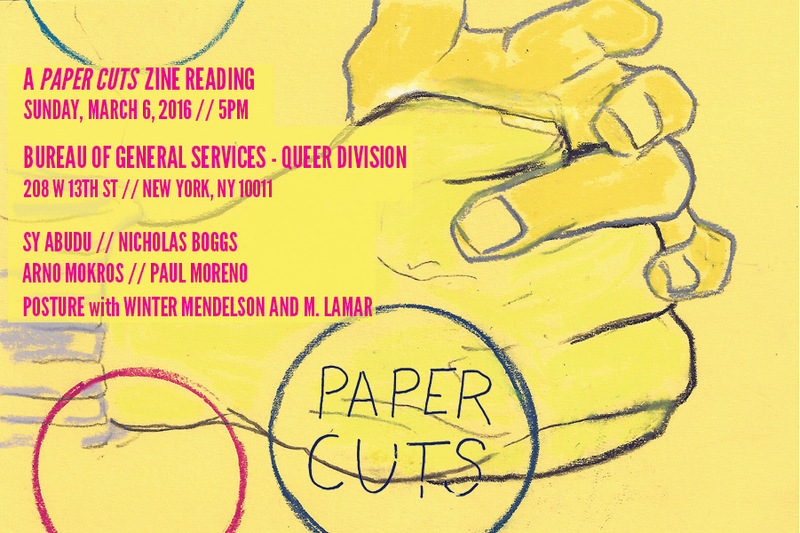 She has been in multiple anthologies including Sweaty Palms, Dirty Diamonds Vol 6, and Comics for Choice. Her second volume of her mental health series Everything's Fine has been nominated for a Broken Pencil Zine Award, received an honorable mention for a DINKy award in the best zine category, and won a MICE mini grant. 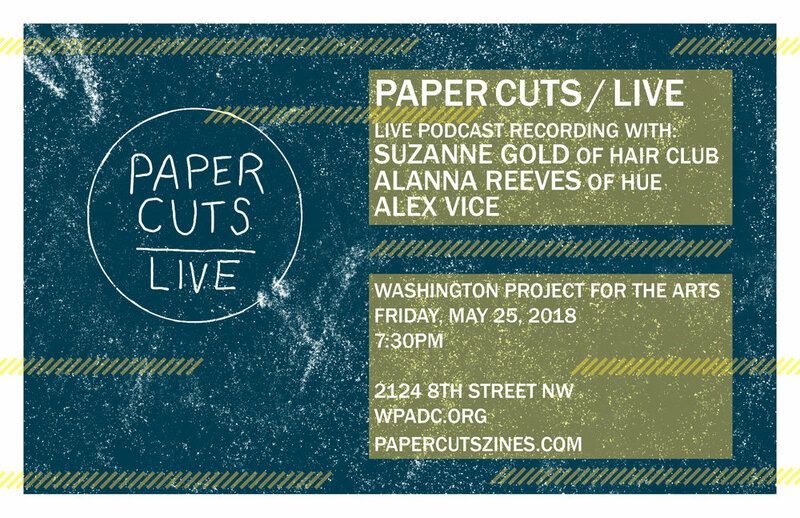 HAIR CLUB is an interdisciplinary, research-based collaboration started in 2014 by artists Suzanne Gold, Kelly Lloyd, and Michal Lynn Shumate. HAIR CLUB mounts public events, curates exhibitions, and publishes books by artists whose work centers on hair as material, theme, or subject. Expansive conversation events called Hair Salons, as well as Merkin-Making Workshops are permanent fixtures of HAIR CLUB's programming. In the summer of 2017, HAIR CLUB taught a three-week, intensive course called HAIR HAIR HAIR! at Ox-bow School of Art and Artist Residency in Saugatuck, Michigan, and in June 2018, they will be teaching a class at Humboldt University in Berlin, Germany. HUE is a web based zine dedicated to the exploration of color in terms of its chemical composition, historical origin, and cultural significance. HUE is a reaction to a trend in color mixing that has resulted in the creation of ready-made color Caucasian Flesh Tone / Portrait Pink / Flesh Tone. This pinkish hue caters to a specific demographic that is not inherently negative until one considers that no other color has been created to match non-Caucasian skin tones and its existence supports the idea that a color can be crafted and made to serve as a definitive representation of a particular ethnic group. 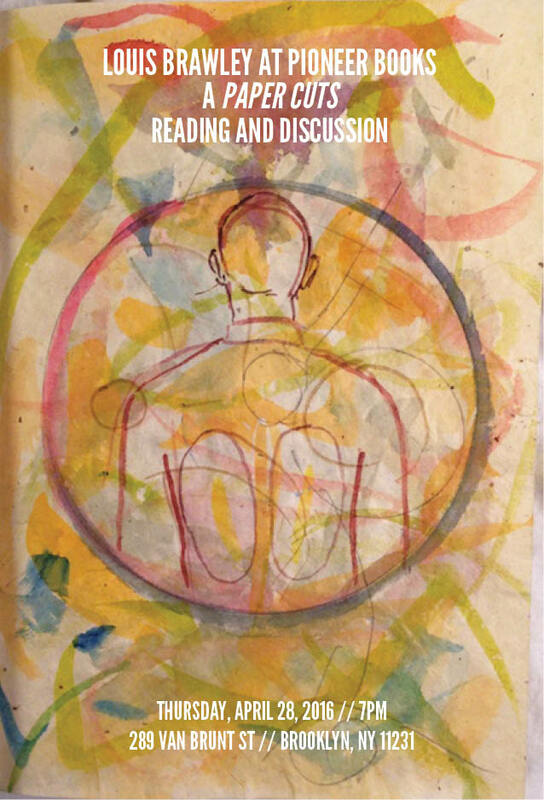 Through quarterly publications, HUE endeavors to explore technical and chemical compositions of a variety of colors and invites contributors to reflect on their personal associations with these hues as well as share and enlighten others to varying cultural significance. Alex Vice is a Maryland-based artist wrapping up a BFA at Towson University. For Vice, the process of nomadic sketchbooking has become a significant source of idea development. Through images of dominant figures in surreal landscapes, her goal is to communicate ideas concerning the repetition of history in contrast to everyday experiences. 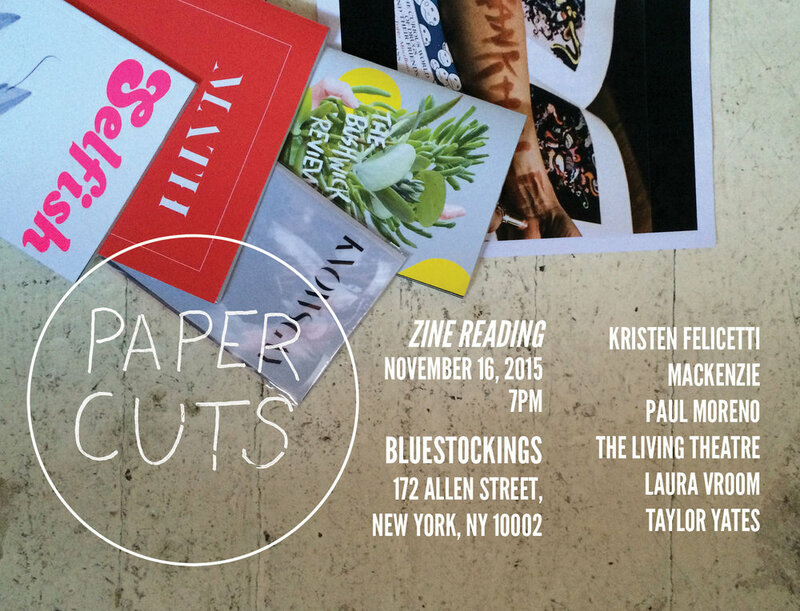 Her work has been featured at the DC Art Book Fair, Richmond Zine Fest, and MACROCK Festival. 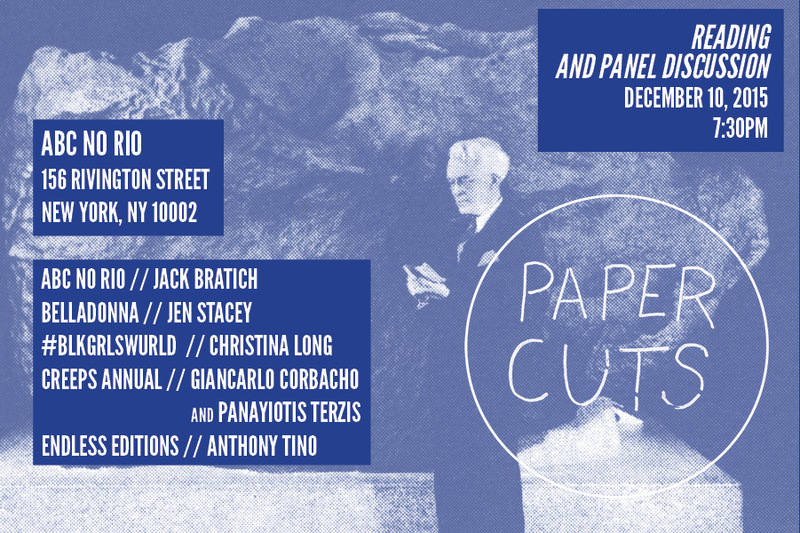 Join us for the next PAPER CUTS / LIVE conversation, curated by artist Christopher Kardambikis. 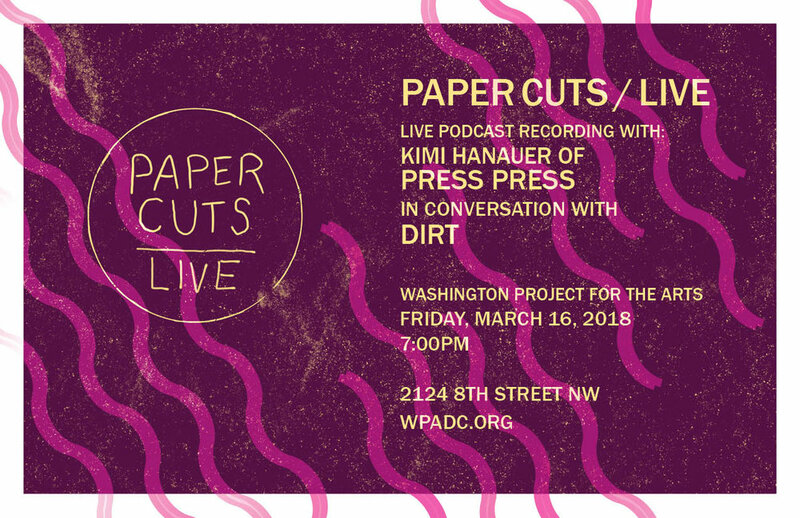 Kimi Hanauer of Press Press and co-founders of DIRT will discuss how they both work to serve the arts community through publications. The conversation will be recorded and archived as a PAPER CUTS podcast. 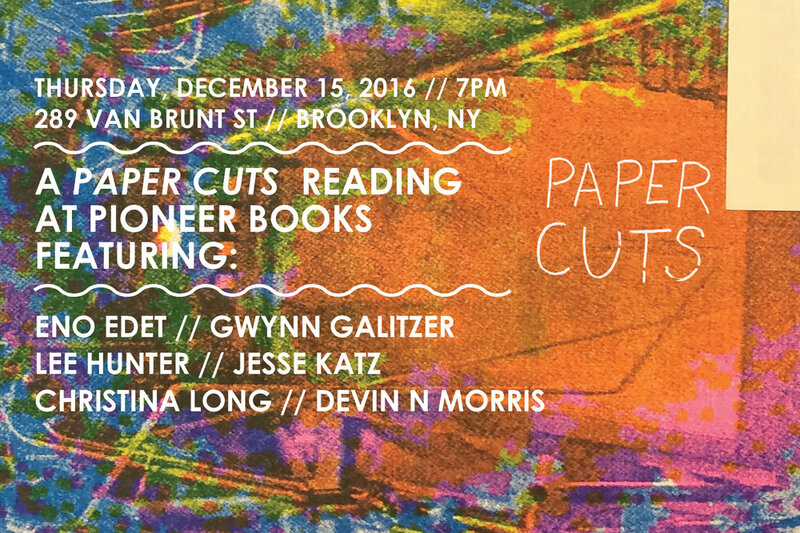 Join us for the launch of the fourth iteration of Bookshelves, PAPER CUTS / LIVE, curated by artist Christopher Kardambikis. 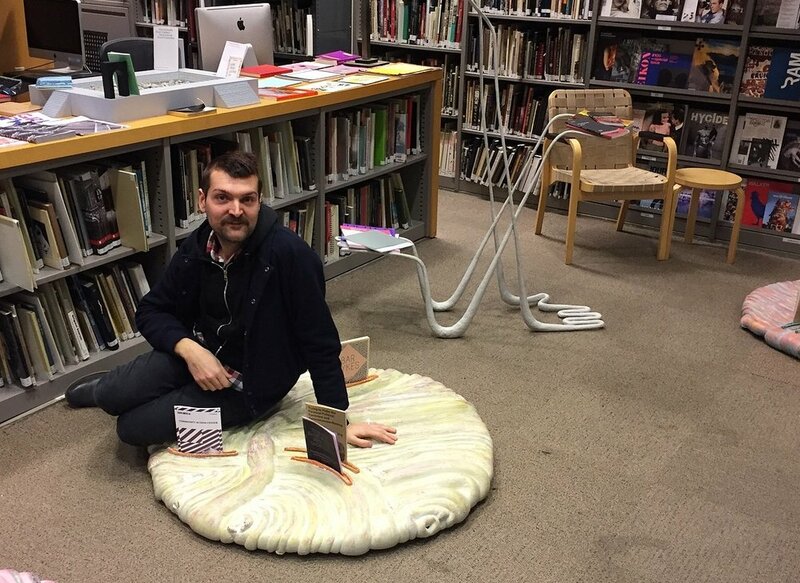 Brett Suemnicht of GenderFail, whose publications are featured on the shelf, will read from his zines and then speak to Kardambikis about his practice. The conversation will be recorded and archived as a PAPER CUTS podcast.